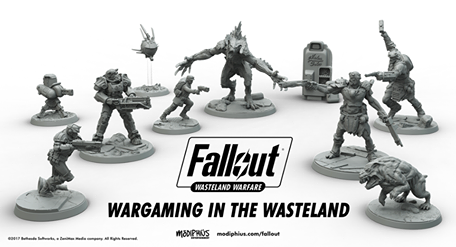 At no point in my life did I dream that actual licensed Fallout miniatures would be available. I don't even know what to say, or even how to express my joy without sounding corny. Be corny all you want. You're safe here. Out of the Basement, into the Streets. I've actually never played the videogame but it seems flavorful. This is awesome! I've been playing since Fallout 3. I'm not familiar with Modiphius' games, is there likely to be much in the way of story in the co-op/solo missions? If so, do you have any details on who the writer(s) are for these, and whether they're in-house or from Bethesda? Finally, is there a campaign or are the missions unconnected? @me we're still in the early stages of development. Decisions have yet to be made. You are welcome to make suggestions. OK, well in that case a huge suggestion would be to check out the Van Buren design documents (see http://fallout.wikia.com/wiki/Van_Buren_design_documents). If you look at the characters and quests outlined in those you'll have a solid basis for authentic Fallout storylines that were never used (as the game in question was never finished). As you've gone with the Fallout 4 visual design for the characters, saying you're looking at including elements from Van Buren would be a great way to get fans of the older Black Isle titles on board for your game. Is there any type of time frame for the release of the minis? What do you mean when you said "You are welcome to make suggestions."? I already made some comments in the other threat and I must said that I am pretty excited about this game. Now I realize my "vision" of what could be a tabletop Fallout game is probably a bit different than the average wargamer. But before I make more comments, a question: do you have access to all the gaming material Bethesda already produced for their games? If yes, I strongly suggest you keep an eye on the stuff produced for Fallout Shelter. Craig Lafferty managed to do a very-good synthesis of the Fallout canon, keeping it rational in size but style giving players a good sizable chunk of the Fallout universe (I am talking about the material, not the game system). This is amazing!! When I saw the first picture with thte mutants on the right and the humans on the left I could not believe my eyes. I would love to see some kind of Interaction with Structures or buildings. I saw the Nuka cola machine and thought of the possibility to have certain interaction options like " loot " or "sabotage" maybe even "hacking". Laying beartraps, mines or tripwires would be cool as well. What's the scale of the battles supposed to be like? Like will it be sort of like small squad based skirmished like in Dead zone or Army clashing like in 40k? I hope we get plenty of miniatures and terrain. Maybe some nice modular gaming board. Nice Art for rulebooks etc. @Hunter, we're still in the early stages of design, so a lot of decisions haven't been made yet.